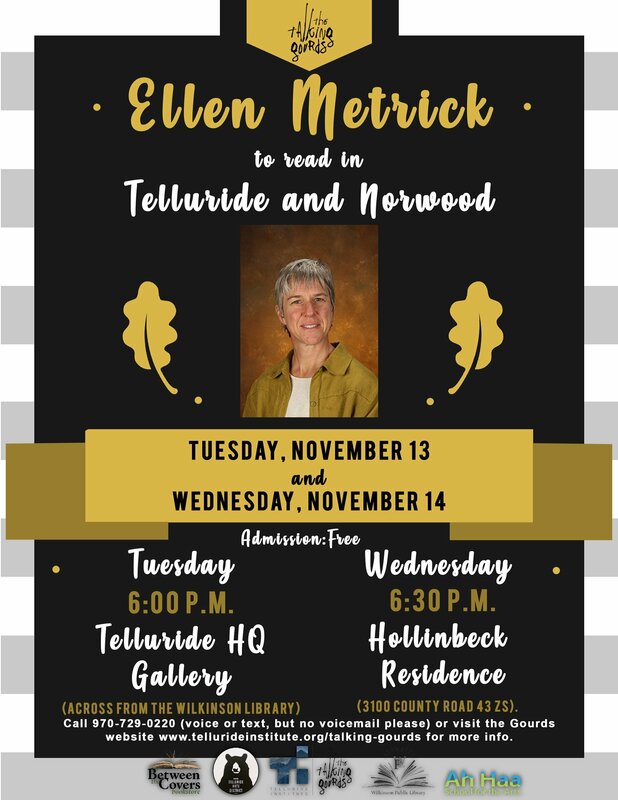 The Telluride Institute’s Talking Gourds Poetry Club is proud to host Wrights Mesa poet Ellen Metrick on Tuesday night, Nov. 13th, starting at 6 p.m. at the Telluride Arts HQ gallery across from the Wilkinson Public Library, and Wednesday, Nov. 14th, starting at 6:30 p.m. at the Hollinbeck residence (3100 County Road 43 ZS). (Directions available upon request.) Theme for this month is Vulnerability. Metrick holds an MA in Versecraft from Western Colorado University in Gunnison. 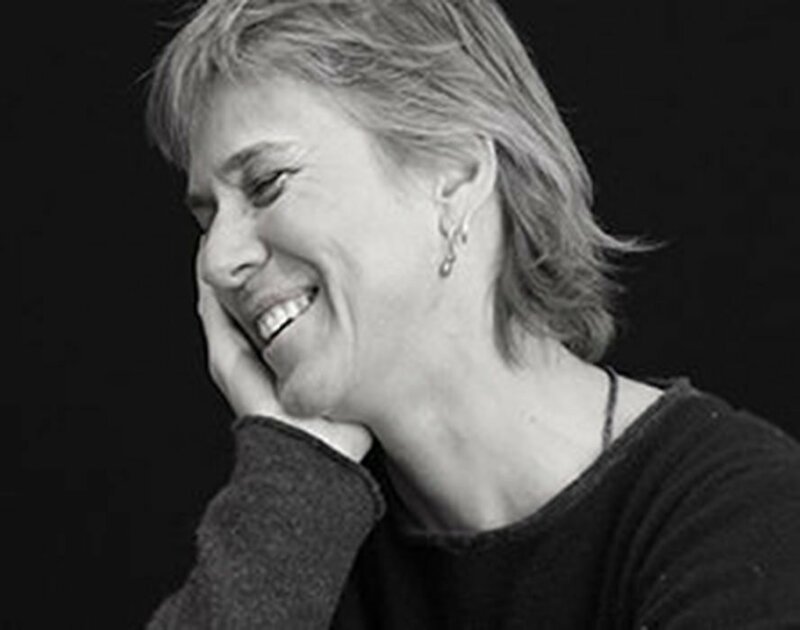 A frequent participant in Western Slope poetry festivals (Talking Gourds, Sparrows, Karen Chamberlain, Gunnison Valley), she was named San Miguel County Poet Laureate from 2011 [C.E.) to 2013 [C.E.] Her books include Poetisattva (WaterWoman Productions, 2000 [C.E.]) and Teasing out the Divine (Mercury HeartLink, 2012 [C.E.]). As a professional teacher, she has been working in the middle school public school system since 2012 [C.E. ], but she began teaching in 1982 [C.E.] in an outdoor education program, and continued teaching in private schools in Japan and as a poet-in-the-schools here in the States. She lives with her teenage daughter at Meadowlark House on Wrights Mesa. Poetry Club announcements are followed by the featured performance. Then, following a short break, the gourd is passed and everyone has a chance to read a poem or two (their own, or one from a favorite poet). Next up in our Talking Gourds Poetry Club series Ruth Duffy and Michael Olschewsky of Nucla will read Dec. 17th in Norwood and Dec. 18th in Telluride (theme: Teachers); the Open Bard Poets of Ridgway will read Jan. 22nd in Telluride only (theme: Ars Poetica — poems about the art of writing poems). Submissions for the $1000 Fischer Prize (national) and $500 Cantor Award (Colorado) are now being accepted. Poetry club members get a half-price discount on submission fees for those prizes. Call 970-729-0220 (voice or text, but no voicemail please).